If you visited the Christmas and Easter Markets at Krogerup and tasted the delicious freshly baked 'kanelsnegle' (cinnamon rolls) still warm from the bakery and oozing with cardamon, cinnamon and icing, you will already know what the fuss is about. If you have since been hankering for a worthy accompaniment to your morning coffee, then look no further. Aarstiderne have 'released' the cinnamon roll recipe on facebook and so this week I donned my apron and set to. I am delighted to bring you a tried and tested translation of Charlie's recipe and I think you'll agree that if you can't make it up to Krogerup for a taste of the real thing, then this is the next best option. To make the dough, start by melting the butter and then let it cool. Warm the milk a little and then stir in the yeast until it dissolves. Add the sugar, cardamon, the beaten egg and the melted butter - in that order. Finally mix in the flour (I found about 550g was enough) to make a dough and knead the dough until it is soft and smooth but not sticky. When the dough has risen, knock it down and roll it out to a rectangle about 1½ cm thick. To make the filling, mix all the ingredients together and spread the mixture over the dough. Roll the dough as you would to make a swiss roll and then cut the 'snails' about 2 cm thick. Charlie baked the rolls on trays with each one in an individual paper muffin case. If you can't find the large muffin cases then she suggests using baking paper instead. I have found that using baking paper can mean that the pastry spreads during cooking and the filling can escape. 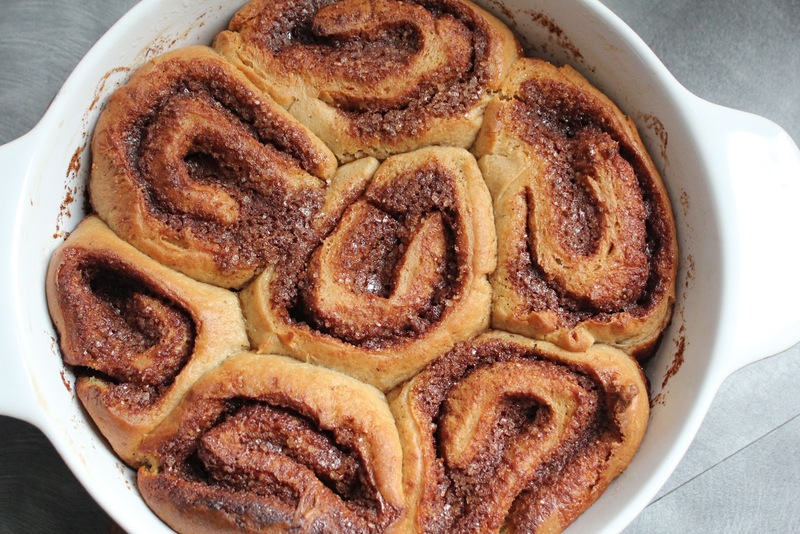 An alternative is to bake a dish of cinnamon rolls. Place them in a greased dish with a little space between each one. This way any filling that escapes during baking doesn't get burnt (or lost!). This is me going 'off piste' but I do find that the rolls are easier to transport this way too (if you're making a batch to take to brunch, for example). In any event, once you have decided upon your preferred method of baking and the rolls are ready, leave them to rise for 30 minutes at room temperature. When they are ready, garnish the cinnamon rolls with icing or chocolate. It's best to decorate them a couple of minutes after they come out of the oven whilst they are still warm (but not too hot) and so that the icing or chocolate melts in. I use 2 tbsps of just-boiled water and mix in 100g of icing sugar and then drip it over the pastries. After that, it's completely up to you how long you wait before diving in! As I mentioned earlier, I think that the pre-baked rolls can be frozen for future use. Again, I am going off piste here but after they have been left to rise a second time, the rolls can be frozen on a tray and then stacked (separated by squares of baking paper) in a ziploc bag. When you are ready to use them, defrost them overnight and then bake them in the morning.